Grab a group of girlfriends and head to New York’s Finger Lakes. Spend the day in Aurora and visit the Mackenzie-Childs Farmhouse – it’s wacky and whimsical and full of home dec inspiration. 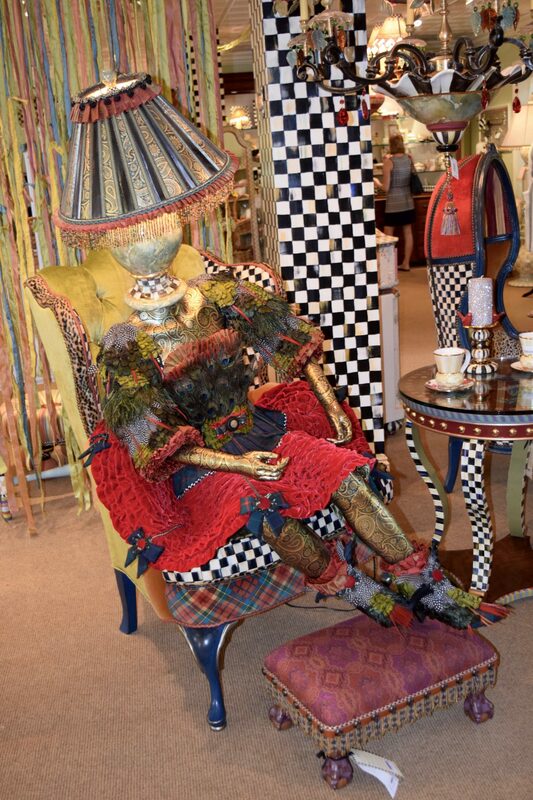 And, if you go in July, check out the legendary Mackenzie-Childs barn sale. 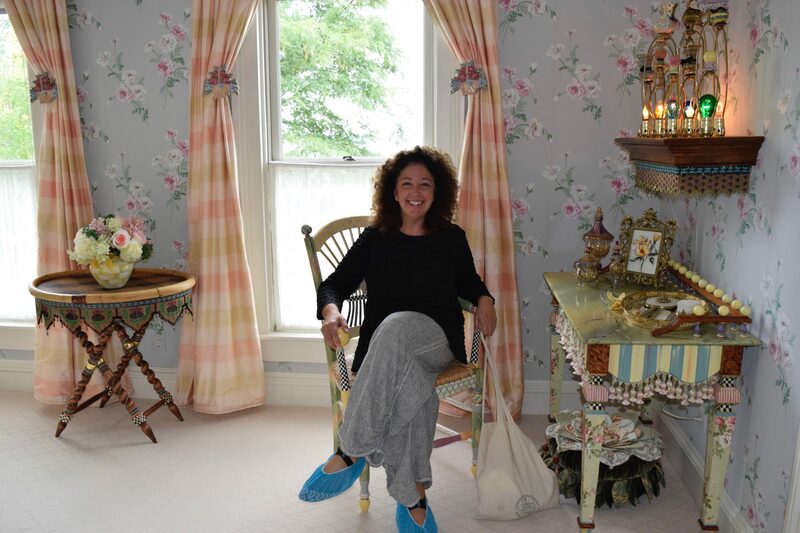 That was my first question for tour guide Patricia, as she opened the front door to the Mackenzie-Childs farmhouse and asked us to slip on paper booties. Mackenzie-Childs is a home decor line featuring wild patterns and outrageous color schemes. 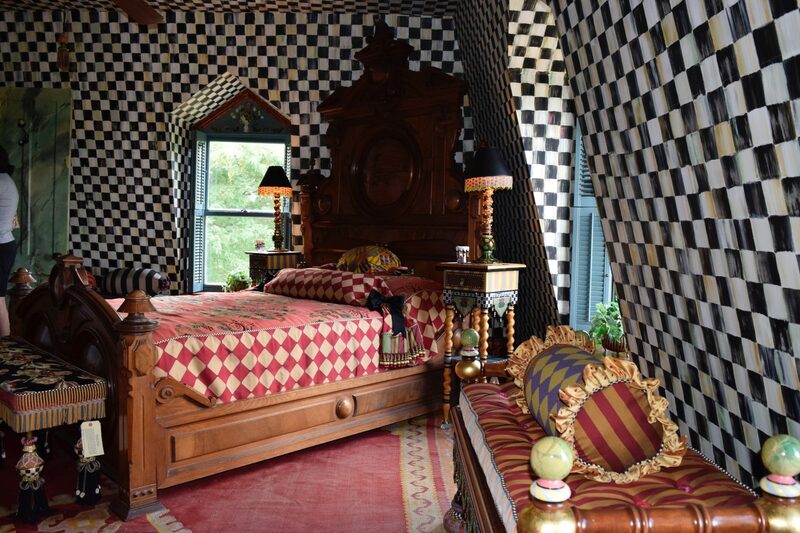 The company was launched by husband and wife potters, Richard and Victoria Mackenzie-Childs, in the early 1980’s in the tiny village of Aurora, located in New York’s Finger Lakes. The company filed for bankruptcy and was acquired by Pleasant Rowland, founder of the American Girl doll company, in 2001. There was some unpleasantness that followed, including the dismissal of the founders and a trademark lawsuit, but Mackenzie-Childs is currently thriving, operating the Aurora facility and a number of retail locations. I was disappointed that visitors can’t tour the production facilities at the Aurora location for additional design inspiration, but there’s a gift shop where a 15-minute video gives an idea of the level of craftsmanship dedicated to creating each Mackenzie-Childs piece. Designers create initial sketches and then work with ceramicists to create the production process which may include fashioning multi-part moulds for slip pours. Each piece is hand cleaned, painted and kiln-fired in different stages and decorated with the festoons, ribbons, decals and thingamabobs. Every artisan stamps his or her mark on the piece before it is affixed with an astonishingly high price tag and offered for sale. 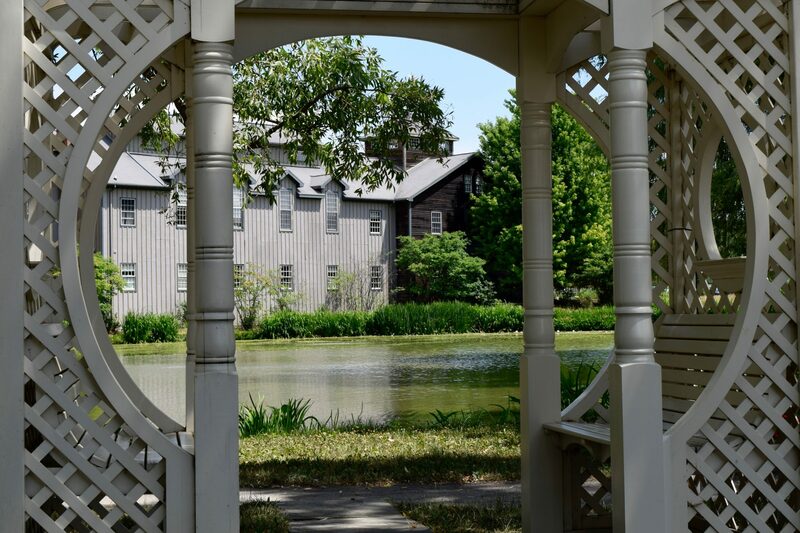 Also on the Mackenzie-Childs grounds is an outdoor cafe for light refreshments, a country garden set aside a pond and the 15-room farmhouse, which is open for free tours. I tagged along with a group of Long Islanders celebrating a 50th birthday and seeking design inspiration. Our tour guide Patricia directed us to the porch and then she ducked around back, so she could open the front door to formally welcome us. Patricia joined the Mackenzie-Childs family 11 years ago after a career as a financial analyst. She originally considered joining the production team but realized quickly she wasn’t suited to life as a painter, since she can’t paint nor sit still and keep quiet for hours on end, as is required in the assembly facility. We wandered gape-mouthed through the Mackenzie-Childs farmhouse as Patricia pointed out the current and discontinued patterns on display: Tourquay, Frank and Mustard, Butterfly, Lemon Curd, Maclachlan. Each room had so much design inspiration going on though, you couldn’t really focus on one thing. I started to get a headache from sensory overload so I hung back to look at each room like a Seurat pointillist painting, letting all of the individual items blend into a pleasant whole. The colors are appealing and the individual Mackenzie-Childs pieces, like the adorable whistling teapot, are like grownup dollhouse furnishings. The entire group swooned in unison when Patricia opened an armoire to reveal a complete mini-kitchen with sink, refrigerator, and storage. “I want that!” I hollered and then Patricia mentioned that the price tag was over $20,000! Yikes! I also wanted the adorable vanity festooned with rabbits. I considered grabbing it and trying to escape, but knew that Patricia would tackle me before I got to the landing. If I ever have a granddaughter though…I know where to look for design inspiration. I’m currently entertaining the fantasy of buying a rambling old farmhouse to putter around in. Why? Primarily to indulge my HGTV-inspired passion for interior design. I’d like the farmhouse to have 7 or 8 bedrooms that I could decorate in different styles: ladies’ dressing room, mountain lodge, beach cottage. My visit to the Mackenzie-Childs farmhouse only added fuel to my real estate fire. Each of the bedrooms had cute names stenciled on the doors. I lingered on the front porch, contemplating the names I’d give my farmhouse bedrooms and fantasized about how good a frosty lemonade would taste while rocking and gazing at my imaginary chickens. I can’t afford to buy Mackenzie-Childs, but the dreams are free! 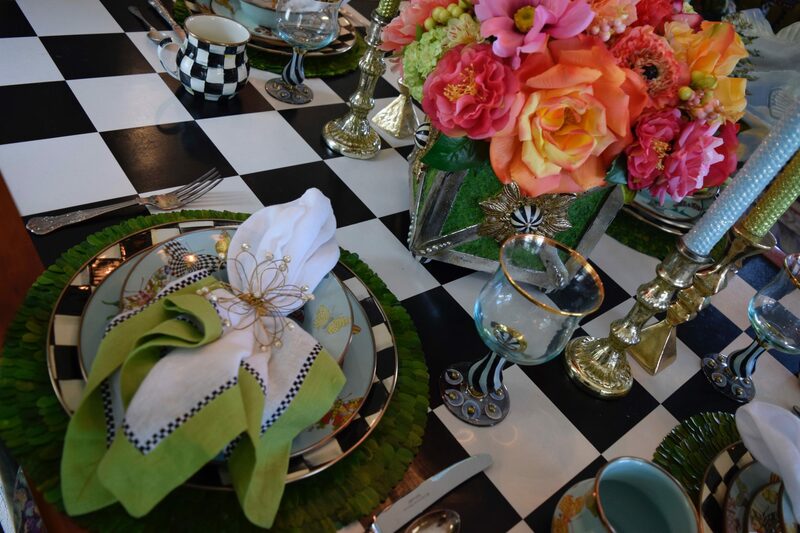 The Mackenzie-Childs Visitor Center is open year round from 10 a.m. – 5 p.m.. Regularly scheduled farmhouse tours are at 11 a.m., 1 and 2 p.m., with additional tours during the summer. Admission is free. The gift shop offers the full line of Mackenzie-Childs products for sale. As noted, most of these items are VERY expensive. Once a year, the Aurora location hosts a 4-day barn sale, offering substantial discounts of 50-80% off. Die-hard collectors camp out in the field to ensure early entry and the best selection. The 2018 dates for the Mackenzie-Childs Barn sale are Thursday – Sunday, July 12 – 15. If camping out isn’t your thing, there are hotels in Aurora (Check out my review of the adorable Aurora Inn) and nearby Auburn and Ithaca. Additionally, Wells College is offering dorm rooms for $55. The sale starts promptly at 8 a.m. on the 12th. All sales are final and personal checks are NOT accepted. For more details, check the Mackenzie-Childs Barn Sale page on the company website. « Still Haven’t Booked a Summer Vacation? Check Out the 15 Best East Coast Beaches and Get Packing. Wow, what an interesting place that I’d never heard of before. But I have seen that black & white pattered pottery before! Wow, wild inspiring interiors. Wonderful fun to visit, I wonder how fun to live with? You might like the Greenbriar in West Virginia. Similarly chock-a-block style, punctuated with black and white geometrical design. I love this guest house. Its really looking so beautiful.